The Big Shot is a must for every craft stash. It's a manual, multi-purpose, die-cutting system that you can use to create die-cut or embossed shapes, envelopes, tags, embellishments, and 3D items. It is extremely quick and easy to use. It's a durable and portable item, and the best thing about it is there is no electricity is required. You simply turn the handle to create your masterpiece! As you can see it is so simple to use! 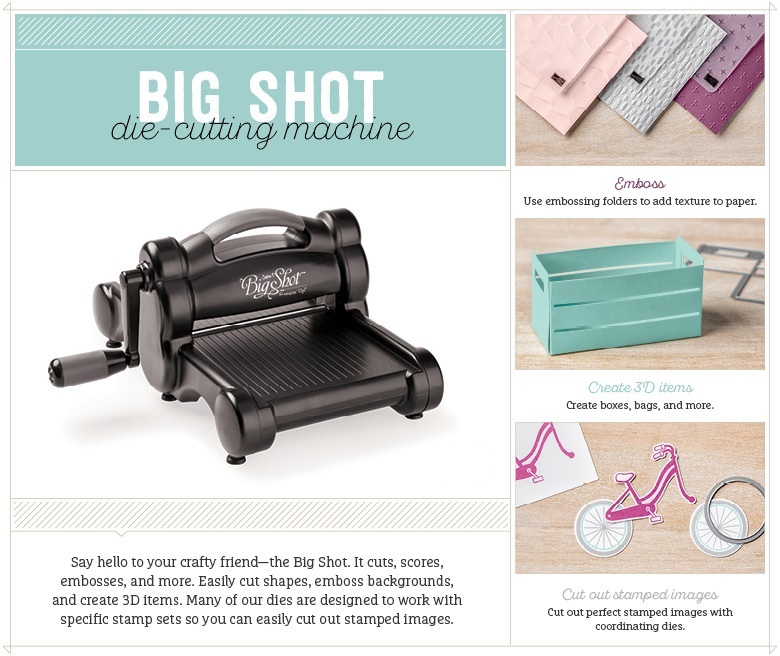 Purchase of the Big Shot includes the Standard Cutting Pads and a Multipurpose Platform. Both of these are available as seperate items. There are other add-on items such as the Magnetic Platform which is a brilliant addition. We have lots of gorgeous products to use in the Big Shot, my favourite of all probably have to be our Embossing Folders. We also stock lots of Dies, and of course the Big Shot and all the Accessories that go with it. Please don't hesitate to get in touch if you have any questions about the Big Shot or any of our other products, the email address is at the top of this page.